By participating with a minimum of 20 acceptable items you earn the privilege to shop before the public. The Consignors Private Sale will be held April 17th; No children under 10 are permitted after 5:00pm during the private sale. Be sure to pick-up your wristband at drop-off. 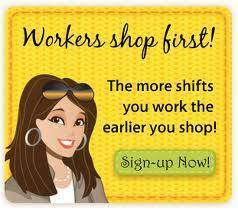 Our consignors earn 70% of their sales, whether they work or not. We charge a non-refundable $5 registration fee that is paid online when you register. There is a also a $10 Participation fee for consignors who choose not to work a volunteer shift. CHECK-OUT how you can have your Participation fee waived and even qualify to earn 100% of your sales on our WORKERS page by clicking the link above!